Quite often readers email me with questions relating to sushi. Usually they’re easy to respond to, or if I don’t know the answer a quick search will help me out. But every once in a while, I’m completely stumped by a question. Such was the case with a recent email. A reader asked me five questions relating design to sushi, and since I’m at a loss for how to answer these questions really well, I’d like your help. Here are the five questions. If you can answer even just one of them, I’d really appreciate it. Then later this week, I’ll combine all your thoughts to come up with a final list of answers that I can send back to the reader, and of course I’ll post them here for those who are interested. Thank you so much in advance! What are the basic principles of sushi? What are the higher principles of sushi? How does one measure “balance” in sushi? Is there such a thing as the perfect roll? If so, what makes it perfect? 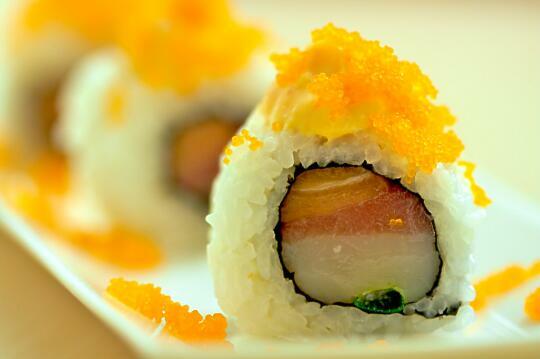 As for this sushi roll, wouldn’t you agree that it’s designed quite beautifully? I’d say a nice balance is found between the ingredients – just try it, and you’ll see what I mean. For lovers of sashimi, it’s really fantastic. P.P.S. Sushi Day was the victim of a Drive-By Shooting! Hop on over there to see what they said about Sushi Day… but don’t worry, their critique is great, and any shooting, exploding, burning down, or otherwise murdering of my blog is all in good fun. Slice each piece of sashimi into long strips, about 1 cm in diameter. Slice each scallop in half. Remove the white bulbs from the green onion stalks. Wash the stalks both inside and out. Roll the sushi inside-out, using a slice of tuna, a slice of salmon, four scallop halves, and a stalk of green onion as your fillings. Drizzle the spicy mayonnaise on top of the sushi. Top each piece with a small pile of tobiko. Where I come from, the basic principle of sushi is letting the pro do the work. Sushi making belongs to certified professional sushi chefs in Japan. The kind of sushi I’m taling about is Nigiri sushi. It takes a sushi chef at least three years to master how to check the quality of the fish, and how to clean, open and slice the fish right. The chef has to have an extensive knowledge on disease, parasites and bacteria before they are allowed to handle raw fish. As I grew up in Japan, I have not seen anyone who is not a sushi chef dare attempt to make nigiri sushi at home. Having said that, the popularity of sushi changed this principle outside of Japan. Unlike Nigiri, sushi rolls are easy to make and they don’t require special skills. Besides, you don’t have to use fish. 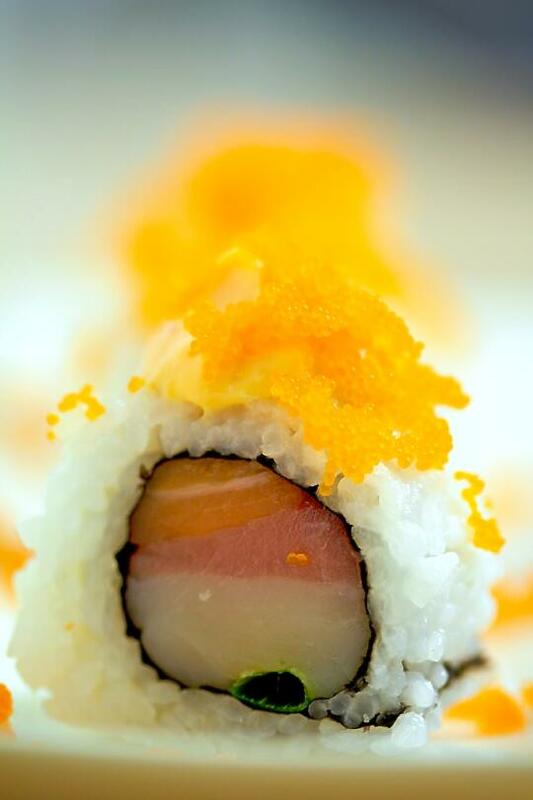 Personally, the basic principle of Sushi Roll is that it tastes as good as it looks. With other types of sushi such as Nigiri, Oshi zushi, and Chirashi, I only trust a pro. When I visited Japan (In the ’80s), I learned the same thing. I agree that the selection of fish should be left up to a professional, but that is presupposed in Allison’s recipe by saying “sashimi-grade” fish. Go to a professional, and let them select (and if you are nervous about it, cut ) the fish for you, then Go for it! Allison – I have to say that this looks like another great roll you have brought to us. Thanks for bringing helping bring sushi making to the general public like this! The most fundamental basic of sushi is perfect rice. Sushi can only be considered sushi if it has rice and the skill involved in making it perfect can take years to master. Also, it’s one of the defining differences in the way sushi tastes from one restaurant to another. Presentation is also key. Beyond the rice comes expert seasonality and regionality analysis. A true sushi master will consider the season not just when it comes to selecting in season seafood but also when setting up the presentation so that it mirrors the current season. Also, understanding that no usable ingredient is to be wasted. Including sushi rice. The name we sushi chefs call rice literally means the bones of Buddha so there is a higher call to ensure that there has been no disrespect. And though not traditional, I think that care to ensure that sushi does not have ill affects on our environment (think sustainable seafoods) should be on the top of every sushi chef’s list. Inspiration comes from nature. In season foods should always provide inspiration because they are freshest. And in presentation, a plate that has set up using the mountain to beach technique is almost always perfect. Balance in sushi flavors can be found in sa/shi/sho/su. I could talk for days about this theory alone, but when there is sugar, salt, shoyu, and rice vinegar used in proportion, the flavor is always balanced. My definition of a perfect roll has to go beyond just the ingredients used. Assuming the ingredients used are flawless and the roll itself is beautiful, I would also take into account how the roll falls apart in my mouth. In a perfect roll, the rice releases from the roll upon impact of the first bite inside the mouth. One should have to chew and chew and chew to finally get to the flavors. Also, if the chef is a master, the roll would have been prepared with the size of my mouth taken into account. A great sushi chef always makes the roll size according to mouth it is to feed. There is no such thing as one size fits all. Wow! I never would have imagined the seriousness that went into making sushi! I am very new to sushi. My boyfriend, daughter and I love it so much that I decided that I should learn how to make it so we could save some money, and that’s how I found this wonderful blog. The thing that made this blog stand out to me right away was the creative, fun attitude and exciting recipes. I feel that I am up to a much tougher job than I originally expected after reading about the sushi pro posts though! I haven’t got a clue to any of the answers, but just wanted to say that these photos are fabulous!! Nicisme’s last blog post… A cookie is not just for Christmas! This sushi looks delicious! !Great site!!!! I’m just beginning making sushi, and found this site while researching. Thanks so much for the creative ideas and simple recipes. The biggest problem I’m having is finding sashimi-grade fish in the suburbs of Chicago; we’re a long way from the ocean as well as the diverse cultural communities of downtown. Serene and Bjorn – Er, I’m confused by both your comments, but still thank you for taking the time to comment. New to Sushi – Please don’t be intimidated! It is really quite easy to make sushi at home, and when making it for yourself you certainly don’t have to make your sushi to the standards of professional sushi chefs. Just make what you enjoy! Nicisme, IE Food, and Jams – Thanks! Your food pictures look amazing! Iâ€™d love to know how your setup is when picturing your food. Just a quick question……when you say Sashimi grade fish…..can I assume fresh caught Salmon….from the great lakes here in Ontario…..would work in this application. No. 4. I think great sushi is a result of a perfect balance of temperature between the sushi rice (slightly warm) and the slice of fish (some kind of perfect cold -not too cool, not too icy) and the right flavor of soy sauce – not too salty and not so strong as to drown out the flavor of the fish. MakiMom’s last blog post… Sushi chef glass ceiling for females? Jack – Um… I would assume so, as I’ve made sashimi from fresh-caught tuna. BUT I don’t know much (if anything) about fishing and how to clean the fish, etc., so I can’t be 100% sure. “Tobiko” wasn’t in your glossary but I assume from your recipes, it is some kind of fish roe. Very colorful and tasty addition I assume! I believe that Sushi is totally different in North America and One who goes into a Sushi shop anywhere in North America doesn’t expect the Chef to be a “True” Sushi chef, that is a real master from Japan with years of experience just cooking rice etc.etc. But one thing I would like is to have the names of the rolls unified though out N.A. like the Dynamite roll pictures here, on the east coast this is the dynamite roll. But on the west coast a Dynamite roll is a Tempura prawn roll with avocado,mayonaise and Tobiko. there should be some kind of North American Sushi Organization to get it all unified, or else we will have every Sushi “CHEF” from North America making and naming their own rolls as they please…. I was wondering, the mayo and sauce mixed together is somewhat like Dynamite Sauce right? Do you have anything on your site that shows just how to make that? My boyfriend wants authentic tasting Dynamite Sauce and I’ve looked around and some say sesame oil, some say roe and some say to use sugar in it. I thought if anybody knew how to make it authentic, it’d be you. I love your site by the way. I use it a lot. In fact, I just pointed my boyfriend over in this direction and he made tamago the other day from it.